Fort Myers, FLORIDA – The South West Florida Adrenaline have chosen Admiral® to be the club’s official sportswear and technical kit supplier for the team’s 2013 inaugural season in United Soccer League’s PDL division. The PDL is the top level of men’s amateur soccer in the US with 70 teams in nine regional divisions it is the 4th tier of US soccer. Admiral, the world’s oldest British football brand, supplied kits in the 1970s and 1980s for the English national team and Manchester United. The brand has a long history in the United States as well, having supplied kits for the Tampa Bay Rowdies, New York Cosmos and Vancouver Whitecaps in the original North American Soccer League (NASL). Today the brand is also worn by the 2012 NASL Champions Tampa Bay Rowdies and last years 2011 NASL Champions the Minnesota Stars as well as Caribbean Champions the Puerto Rico Islanders. Admiral supplies many USL teams including 2011 Champions Kitsap Pumas in addition to many youth teams and associations throughout the USA. The South West Florida Adrenaline is a United Soccer League Premier Development League team playing their first season in the PDL. Owner Jeff Buktze said, “We were recommended to work with Admiral by a number of other clubs. 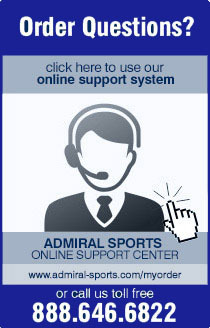 We selected Admiral because they have a great reputation and they worked hard to earn our business. They’re also committed as we are to supporting and developing soccer in South West Florida." The Adrenaline will unveil their new Admiral kits to fans and media prior to their opening home game in May 2013.